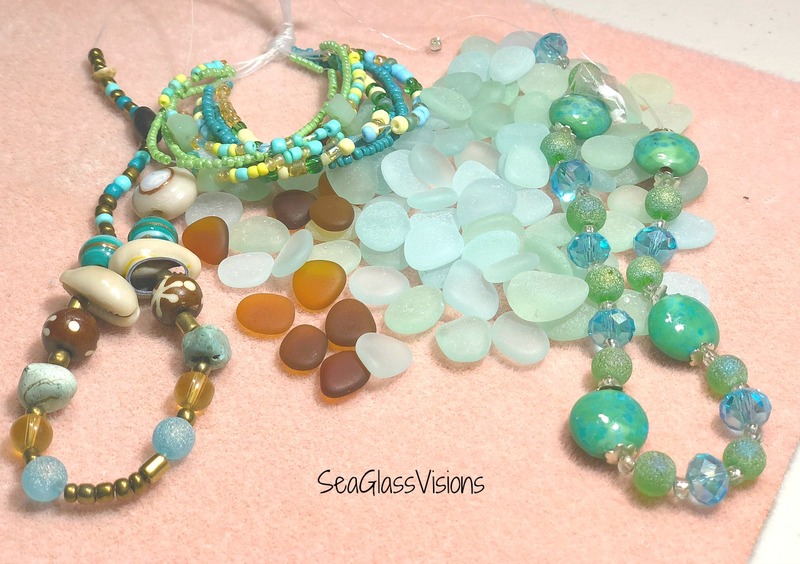 This week my focus is on creating sea glass bracelets. I have at least three different styles planned using lovely aqua and light blue sea glass and some of the beads in the photo below. I have been a bit better this year having jewelry available in my artisan shops and in my Etsy shop in plenty of time for the season/holiday. Yes, I know it’s only been two months and 5 days and the only holiday has been Valentine’s Day. I decided that I will not be creating jewelry for St. Patricks Day. The next holiday I will focus on will be Mother’s Day, and I already some really lovely sea glass pendant and earring sets available in my Etsy shop. I have had many people ask for matching jewelry, it’s the perfect gift! I’m also going to hold off introducing styles too early for the season. I’ll hold off introducing boho jewelry until warm weather when sun dresses and bathing suits are the preferred clothing of the day! So, I’m going to start creating sea glass bracelets with a beachy theme and be ready for the upcoming summer season! This entry was posted in Creating With Sea Glass, Etsy Sea Glass Jewelry, Sea Glass, Sea Glass Bracelet, Sea Glass Gifts, Sea Glass Jewelry, Sea Glass Jewelry on Etsy, Sea Glass Pendants, Selling Sea Glass Jewelry by Cathy. Bookmark the permalink.